Author’s note: This post was first published November 3rd, 2010. It looks like Sarah is on blog hiatus. Still, feel free to comment. As I am busy climbing a mountain now, I’ll respond to all comments when I return. Thanks! Sarah over at The Wit and Wisdom of Another Sarah (you should go check out her place if you haven’t already!) had a great post last week about Alfred Hitchcock–and his various projects and cameos. We as writers are no strangers to the advice: “Do something different!” We hear it everywhere from writing how-to books to forums to blog posts to writing conferences. Originality is a pretty key element of good fiction, and arguably–although in film rather than fiction–Hitchcock was the master at finding original approaches to familiar story elements. **In Psycho, he kills off the main character halfway through the film, something never done before. The genius is, of course, that this is the last thing the audience suspects, so the rest of the film feels untethered and eerie–the very effect Hitchcock was no doubt going for. 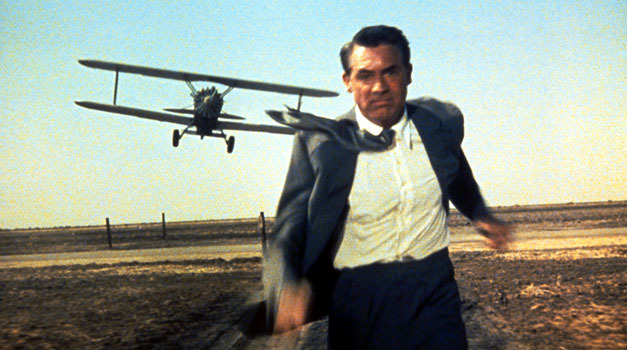 **North By Northwest upped the stakes when Hitchcock turns what could have been a run-of-the-mill chase scene into something truly memorable by substituting a biplane for a car. Those scenes where Cary Grant runs across the flat Illinois scree being buzzed by a crazed pilot in a Stearman biplane are downright iconic–and tremendously dramatic too. The chase scene across Mount Rushmore at the end of the movie is equally memorable. Reinventing the usual movie chase scene by changing one element to something unexpected, he raised the tension and drama to the next level. **Lastly, The Birds set the standard for transmogrifying an ordinary element in the everyday world into a truly terrifying phenomenon–long before Stephen King and his ilk picked up that baton. Who’da thunk it, that someone could take the most ordinary everyday creature and turn them into a terrifying plague? Hitchcock, that’s who. Yeah, Hitchcock had the mojo when it came to flipping assumptions on their heads, and there’s a lesson for us all. The next time you’re working on a scene and it feels unoriginal or flat–a problem that comes up often as I plug away at my NaNo project–ask yourself: “What Would Alfred Hitchcock Do?” You may be surprised with the results. What about you? Do you have any similar tools that help you keep your fiction fresh and interesting? farawayeyes said, Love Hitchcock. Gonna keep that WWAHD in mind. Transmogrifying – Are you kidding me? You are awesome. I love nothing better than a seventy-five cent word, but that has got to be a buck fifty at least. Travener said, Certainly food for thought, turning assumptions and conventions upside down. Norman Mailer kills off a major character about three-quarters of the way through The Naked and the Dead. I remember being shocked by it when I read it as a teenager, especially because of the rather offhand way he does it. Something like, "Lt. So-and-so was shot as he rounded a corner…" And nothing quite beats the opening line of Kafka's Metamorphosis: "Gregor Samsa woke up one morning and discovered he had been turned into a cockroach." That, too, I read as a teenager, for German class — and I kept checking and double-checking the German-English dictionary because I just couldn't believe I was translating "cockroach" correctly! oceangirl said, I blog real life so my tool is memory scanner which does not seem to be working well lately. Jeremy Bates said, I love this movie! since before..